The swell of the tide is palpable. I feel the energy beneath me as though the perfect wave is just beginning to form. My body is buzzing with anticipation and patience feels more like a noose than a virtue. While I’m not a surfer, this has been my state of mind for months as I’ve been working and waiting for many initiatives to come to fruition that hold promise to make running outdoors more accessible for my visually impaired and blind peers. Endurance sports have been a God send for me during my vision loss journey since 2007. In the beginning, when everything was spinning out of control, setting a stretch goal to qualify for the Boston Marathon was the antidote for the poison of defeat injected into my soul during the disability application process. I’m also blessed with enough humility to recognize that I could easily become victim of circumstance if I did not force myself to step outside of my comfort zone and embrace new challenges that can be quite anxiety provoking. I have leaned on my responsibility as a parent to give me the courage I need to persevere and constantly remind myself that I have to model for my daughters that one can still be relevant and set ambitious goals in the face of adversity. As a person of Faith, I quickly acknowledged that God doesn’t give those with disabilities a pass, so I took a leap of Faith and fully immersed myself in volunteerism. I’m fueled by the belief that I’m serving as God’s hands in the lives of my visually impaired and blind peers and by the admiration and respect I have for those who have served as my eyes to get me to the start line and finish line of many marathons, a 50-mile endurance run and Ironman. There is great irony in adversity. While nobody would wish adversity on anyone, there is a one-hundred percent certainty that we’ll be brought to our knees by it at some point in our life, yet it can also be the source of incredible blessing. A tandem bicycle accident would certainly put my core values to test. On July 5, 2013, a good friend and I were struck nearly head-on by a 91-year-old woman when we were 2-hours into a training ride on my tandem bicycle. Justin flew off the bike, ricocheted off the windshield and hit the ground. When Justin found me, I was unconscious in the front seat of the car with my head in the lap of the driver and my left leg was protruding through the windshield. My helmet was cracked in half and I sustained a serious concussion, 2 facial fractures, a broken neck and multiple lacerations. When I awoke in the car, I was strangely calm and aware of everything going on around me. I felt no pain. My annoyance for the voices telling me not to move faded into a realization that those extracting me from the car were concerned I was going to die. I said a quick prayer telling God I was ready if he wanted me, but that was obviously not the plan. After arriving to the hospital in expedited fashion by helicopter, I went into surgery to remove glass from my wounds and to sew me up. I woke up with a neck brace that would stay with me for over 3-months. From day one of my recovery, I reminded myself of the adversity mantra I had spoken about countless times. It truly saved me. When in a near panic state the first night home in a hospital bed in my living room, confined by the neck brace, I reminded myself that I just needed to focus on “What can I do?” Well… in this case, I said, “I can breathe.” That was all I felt I could focus on and that was also at risk as I felt on the verge of hyperventilating. That was my starting place. With God’s grace, I had no spinal cord injury so my focus ultimately led to how soon could I start running and organizing the National Marathon Championships for the Visually Impaired. I was inspired to persevere by the combat blinded veterans who would be traveling to my home town to run in the event and by my good friend Justin. Taking one-day at a time, another friend of mine, Matt, came along side me to help me train and cross the finish line of the California International Marathon 5-months and 3-days after the accident and less than 2 months after I was able to remove the neck brace. The accident reinforced that my coping strategies for overcoming adversity worked for me, but it also heightened everyone sensitivity for my safety. I was constantly being made aware by my family of all the distracted drivers on the road and we began to take particular notice of all those not wearing bicycle helmets. My 14-year-old daughter Lindsey ultimately ended up creating a bicycle helmet safety video for her school to help make a difference: http://youtu.be/gyy_Yg5yciY. Lindsey, witnessing me periodically leave our house for shorter runs without a guide, started asking more questions about when I would apply for a guide dog. Lindsey knew it was taboo to jog with a guide dog, but she also knew I had recently had a promising conversation about this very topic with a fellow visually impaired marathoner who had just became the CEO of Guiding Eyes for the Blind in New York. Lindsey persisted with her nagging until I agreed to call Thomas Panek and ask him if Guiding Eyes had had any follow up discussions. Much to Lindsey’s delight, her nagging opened the door to me being selected for a pilot project by Guiding Eyes, and I’ll be attending their program in August 2015. While there is no guarantee of success when one embarks on a pilot project, Guiding Eyes is fully invested in laying the right foundation, including involving engineers at MIT in making harness handle adaptations which address the different biomechanics involved in jogging. I’m not only excited for this opportunity, but also feel the responsibility for doing everything within my control to help this pilot project succeed so others can follow in my footsteps. I pray daily for the Guiding Eyes team and for the beautiful shepherd they hope to pair me with. This would truly transform my life in many ways! The other positive thing to come out of my accident was an increased urgency to create a resource to unite blind runners and sighted guides across North America. Lack of training partners has been a constant barrier to visually impaired athletes running outdoors. Like me, many visually impaired put themselves at risk running without sighted guides. I also have been convinced over the years that there are visually impaired and blind folks in every community, but have yet to be introduced to the mentors and resources necessary to get outdoors and power walk, jog or run. I also believe there are people with caring hearts in the same communities who would be willing to share the sport they love with someone who would not otherwise be able to participate. What has been missing is a tool to bring them together. So, with my wife’s blessing, we approached Massachusetts Association for the Blind and Visually Impaired about adding this to the list of services they provide. 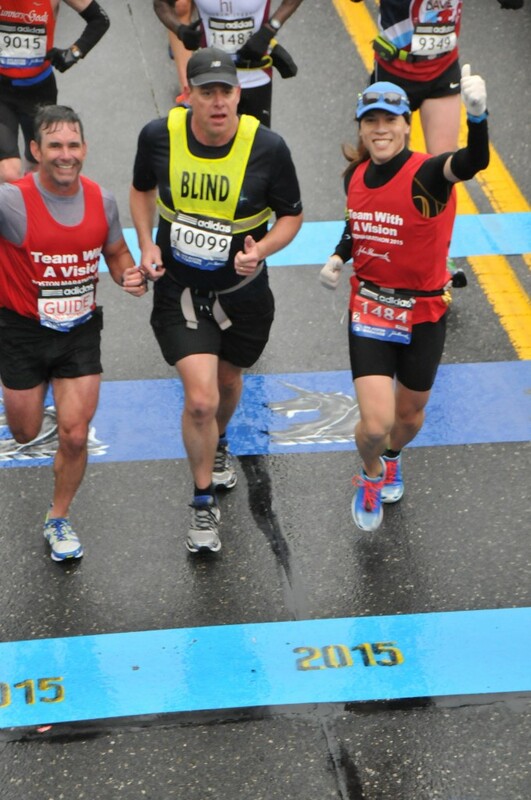 MABVI is the oldest social services agency in the United States serving blind adults and they have been helping blind marathoners in Boston for nearly a quarter of a century. We agreed to fund the development of the website and I volunteered to lead the project. And, I’m proud to report that United in Stride (www.unitedinstride.com) was launched the week leading into the 2015 Boston Marathon! This year’s Boston Marathon held special significance due to the timing of the United in Stride website launch. Also, as a member of MABVI’s Team with a Vision, it is also about educating the public about the abilities of those with vision loss. There were 23 visually impaired and blind runners on the team, all with a unique and inspiring story. We had increased media attention this year due to the participation of two celebrity guides- Scott Jurek (Ultra Runner) and Peter Sagal (Nationally syndicated NPR host). This public attention showcased the value of guiding a blind runner and the impact it has on lives like mine. I’m especially thankful to Dan Streetman and Vincent Hau (Call Sign Scalpel) for sharing in my Boston adventure and helping me get to the finish line in my Boston best of 3:21:12 for a 4th place division finish. Riding the Boston wave into Kansas City to bring attention to the Children’s Center for the Visually Impaired through participation in the Trolley Run and side trip to De Moines Iowa to be presented with the Road Runners Club of America Challenged Athlete Award created adding speaking and media opportunities to promote the abilities of those with vision loss and the launch of United in Stride. There are a lot of promising opportunities in the works. I trust God has a plan for me in all of this. I haven’t been here before but I know with certainty that I’m exactly where I need to be. A sixth sense erodes all insecurity. It’s time to move with the momentum, embrace the unknown, and have faith that I must start paddling to catch the wave that is swelling beneath me. I hope those reading this will join alongside me to make a difference or to share this with someone who will. When it comes to me getting to the start line, I can’t do it without guides sharing the training miles. Special thanks to Eric waterman, Chris Shull, Matt Linderman, Dan Streetman, Greg Bricca, and Tim Ojima for being regular running partners who go out of their way to make my journey possible. I’d also like to thank my coach Jon Klingensmith for creating the training plans and for synching my plans with Dan’s. The UnitedInStride site strikes me as being similar to the popular new BeMyEyes app. A resource that connects sighted helpers with VI who need to borrow someone’s eyes. A brilliant concept, with benefits for all. Impressive! Great read. What an inspiration you are to all of us. Thank you for all the conversations, advice and inspiration. Godspeed my friend.